Trafalgar Wharf: The Drystack Beach Huts get named! You may have noticed a few beautifully painted beach huts on the way to The Drystack. They have now been individually named after some of our favourite spots on the Isle of Wight . So take a look when you are next passing and if you fancy renting Bembridge, Seaview or any of the other sunny spots for store of your boaty bits then contact Corinne on corinne@trafalgarwharf.com. 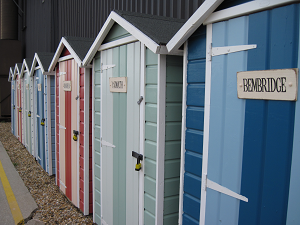 If you fancy visiting some of the places the beach huts are named after, then you are in luck! At The Drystack we have created information sheets showing how to get to some of our favourite destination. Please feel free to take the information sheet with you on your day out, just make sure you return it at the end of your trip and enjoy!